This post describes the rationale and some nuts and bolts of the Government class podcast I'm working on this summer. You can read more about that class and listen to the episodes at governmentclass.mrcbaker.com. This summer school I am delighted to be teaching a 2 week "credit recovery" course for Government, something I taught in my student teaching in 2005, but have not worked with since. One of the things I'm looking most forward to is the class discussion. There are opportunities for these in math class the deeper you go with relevance, 3 Act Math Stories, and or project-based learning, but because much of studying the social sciences is how everything that has (or may) happen relates to you or others, class discussions are something that I like to do several times a week. I used today's first podcast as a way to get the kids to reflect on what they see as the role of the federal government, if they think the government is doing well in that role, and to think of or research specific cases that exemplify their stance. Here's a link to the prewriting doc I put in Google Classroom for them. I gave them 15 minutes to think through the doc and get some of their answers down, stressing that the idea does not have to be at its fullest fruition since we were prewriting. I moved around the room, talking through some ideas with students, clarifying questions, and encouraging that putting good effort in the prewriting was going to make them sound really smart when we started recording. After their prewriting time was up, ordinarily, that's where you would have a class discussion, right? You, the teacher would throw out a question, the students would share their responses, you would counter with follow-up questions to help clarify their statements and summarize for everyone else, and students would respond to each other. And then with the exception perhaps of some stellar note-taking from some student, the discussion would die as soon as the bell rang, living only as a memory, and only for the benefit of the people in the room. But if you record it, the discussion lives on! Why record (and why podcast specifically)? Recording and pushing it out as a podcast invites parents into the classroom without having to be IN the classroom. An audio recording is less intimidating to students who may not want to be on video and less intrusive to the normal flow of the discussion. I set my Chromebook in the middle of the circle, pressed record, and then left it alone. 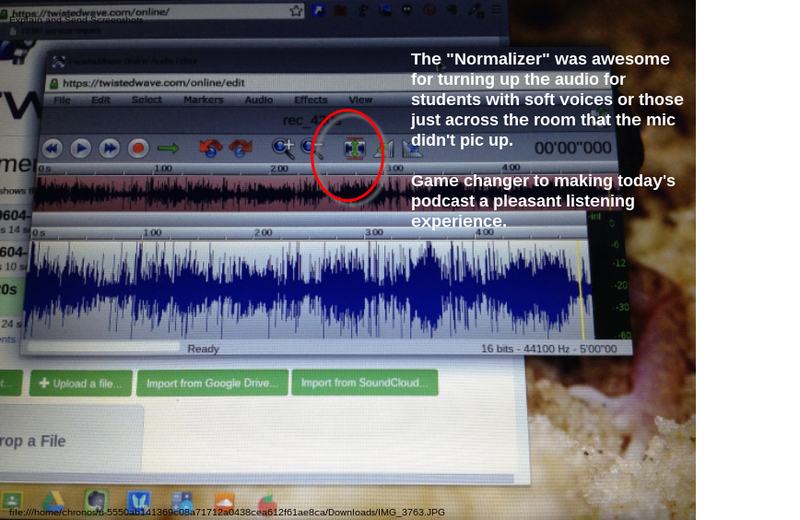 Podcasting the discussion creates an audience for your students beyond their classmates and you, their teacher. A class discussion may have gotten blown off, but everyone was on their best behavior and best engagement while we were recording. Letting kids know you trust and value what they say to put it on the internet is a message of trust and value in them as people. Who doesn't love to hear that? But HOW do I do this, Chuck? 1. Get a voice recorder app for your iOS or Android device, or open up an online audio recorder. Today I used online-voice-recorder.com. When you save/export these, it will save as an .mp3 file. 2. What if you can't hear my students on the playback? 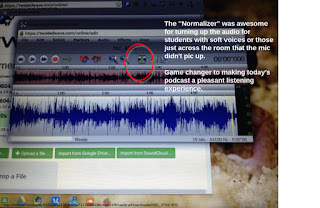 I used twistedwave.com to edit individual files with fade in/fade in or cutting out any period of more than like, 5 seconds of silence, but MUCH more useful was the "normalize' tool, that allowed me to highlight the quiet sound signature from a quiet student, "normalize" it to the rest of the audio, and turn up the volume just in that one segment. 3. Ideally, things will go great and everything your students say will get recorded. :) If that doesn't happen, or you need to separate the recording between different hours (or any other reason you may have two separate .mp3 files that you want together) I used http://audio-joiner.com/ to put my files together after I had them edited how I liked. 4. Do you have the .mp3 file how you want it now? What should you do with it? You could do something like attach the file to your website, Google Classroom, Edmodo, or other LMS, or even share the link from Google Drive via email or Remind. That's by far the simplest solution. If you want to try posting your audio as a real life, honest-to-goodness podcast, you'll need a blog post the files to, generate an RSS feed, and get yourself submitted to iTunes. Here are tutorials for that. When deciding if you need the extra layer of complication submitting to iTunes, consider your audience. Are you podcasting your class discussions for the stakeholders of your school and/or district, or are you hoping to share with a larger audience? If your answer is the former, you don't really have a need for iTunes - people you want to share with can just get the file as an .mp3 shared via email or Google Drive. However, as I said in the Why Podcast section, I sensed that my students stepped up their game knowing that other people were going to be turning in as well, so it is worth the steps to host the podcast on iTunes and this blog. MY next step is to start to train the students to be able to record, facilitate, save the .mp3 files themselves. My government class is less than 10 students this summer - I don't think it would have been as successful an experience if we were trying to get a "regular" class size all engaged in the same discussion at the same time. In that case, I would hope to split it into at least 2 concurrent recording sessions. The obvious advantage here is that then the teacher steps even further into the background and can just sit in a guide/contribute rather than driving the discussion.